Golf Driving Cage - How far can you hit a golf ball? Find out by swinging the club of your choice in our inflatable golf cage. Call Talk of the Town for your next event in the Suburban Maryland, Washington DC and Northern Virginia metro area 301-738-9500. Golf Driving Cage - How far can you hit a golf ball? 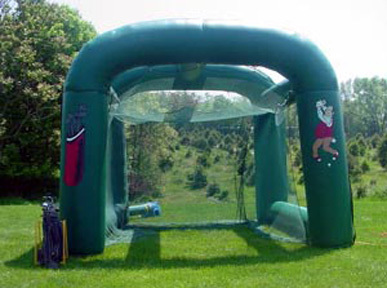 Find out by swinging the club of your choice in our inflatable golf cage. Includes inflatable cage, 1 blower, distance radar gun, right handled and left handed golf clubs, golf balls, baffle net, and 1 attendant. Requires electricity (110-volt, 20-amps)and 10'l x 10'w x 10'h space. Great for all all ages.